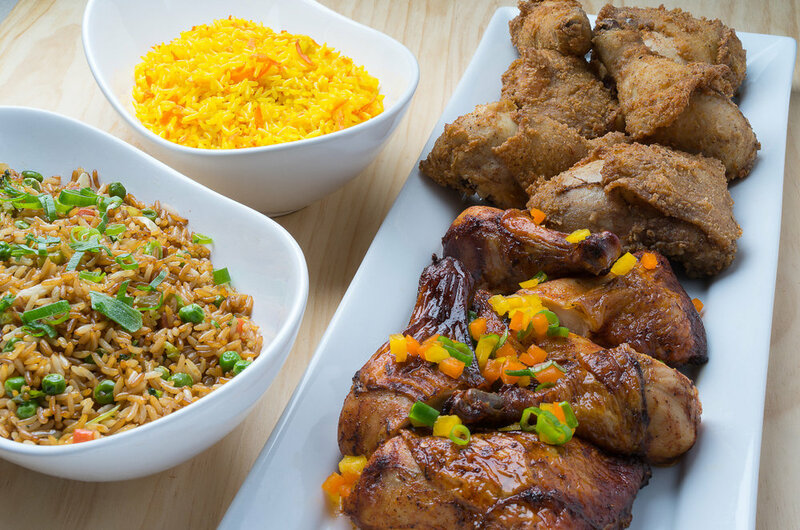 CARIBBEAN CATERING WITH A NORTH AMERICAN TWIST. 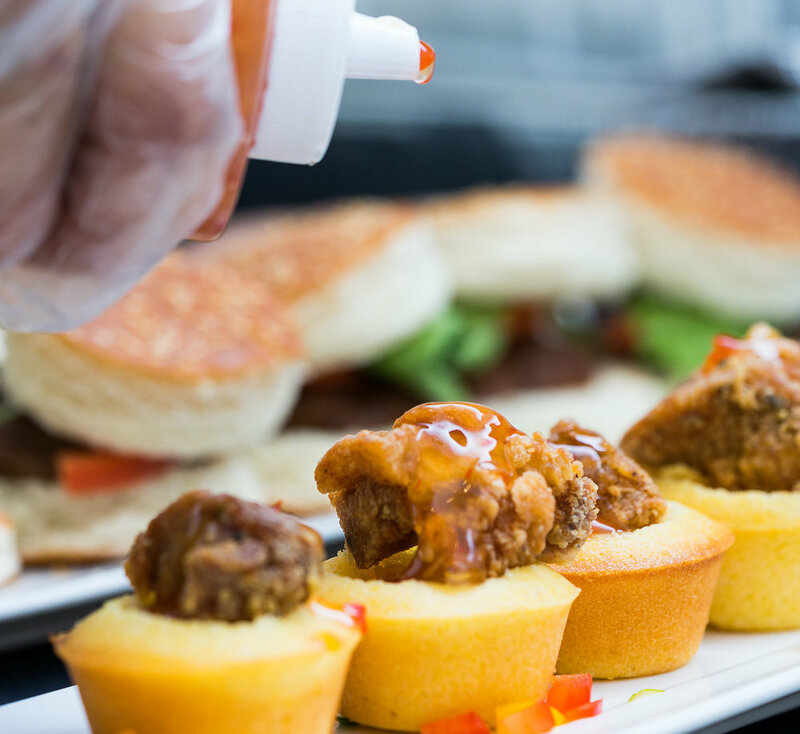 King Catering specializes in Caribbean cuisine with a North American twist, offering event catering, corporate catering, personal chef services, and more. Whether you’re expecting one guest or one hundred, for breakfast, lunch, dinner, or brunch, King Catering will delight you and your guests. Made with seasoned marinated ground beef patty, chili Mayo, King's BBQ sauce and topped with our fresh mango salsa. Marinated chicken, spinach, feta, and sundried tomatoes, tossed in balsamic and served on a sliced baguette. Our Famous Chicken Tacos are irresistible! Seasoned boneless chicken thighs coated with either our in-house Jerk Sauce or BBQ Sauce, served with coleslaw on a soft shell tortilla, topped with chili aioli and coconut garlic sauce. A popular choice with fish lovers. Delicious! Deep-fried plantain, topped with avocado medley and bite-sized Jerk chicken. Truly a taste of paradise! Slowly cooked Jerk Duck with creamy coleslaw on fried plantain. Topped with Chili mayonnaise. Mini cornbread topped with bite-sized fried chicken, drizzled with sweet Chili Thai sauce. Trini-style or Pineapple-Glazed Seasoned ground beef , oven roast meatballs. Served with either Spicy Barbecue sauce or a Pineapple Glaze. Sliced cucumber, Greek yogurt and smoked salmon, topped with fresh dill and a hint of lemon juice. Pan-seared scallops with a dash of salt and pepper, served with a Balsamic reduction. A tasty vacation for your palate, our Shark Tacos are both fresh and full of texture. Lightly breaded deep-fried shark on a soft shell tortilla, served with cabbage, carrots, pineapple, topped off with our in-house tamarind and garlic sauces. Shrimp served with a special cocktail sauce dip. *Soups are 16 oz each. Minimum of 4 orders per soup. *Dressings include Coconut Mango, Balsamic, Citrus, and Caesar. Each salad feeds 4-6 people. Fried cod, stewed in tomato sauce, with onions, green peppers and tomatoes. Slowly cooked to tender. A delicacy! Seasoned for 24 hours, marinated chicken (breast or thigh) is dusted with flour and deep-fried. Diced pork leg marinated in Caribbean herbs and spices before slowly stewed in cumin. Atlantic Salmon marinated with Herbs and Spice, lemon and cooked on the grill with on a cedar wood. Alfredo Penne pasta tossed with our made-from-scratch Jerk Alfredo sauce. Topped with well-seasoned, pan-seared chicken breast and freshly grated Parmesan cheese. Handmade in house Jerk Pork Ravioli topped with Jerk Cheese sauce. Delicious! Our Barbecue Chicken is season and marinated for 48 hours, slowly grilled and coated with our secret in-house King Barbecue Sauce. Our Jerk Chicken is marinated in Caribbean herbs and spices for 48 hours, slowly grilled and coated with our secret in-house King Jerk Sauce. 24-hour marinated chicken, glazed with a pineapple mango sauce before being oven-roasted. Seasoned with the finest herbs and spices the Caribbean has to offer, chicken (leg or breast) is slowly roasted to perfection. Spaghetti pasta tossed with our secret-recipe meatballs and homemade Tomato Basil Sauce. Topped with freshly grated Parmesan cheese. 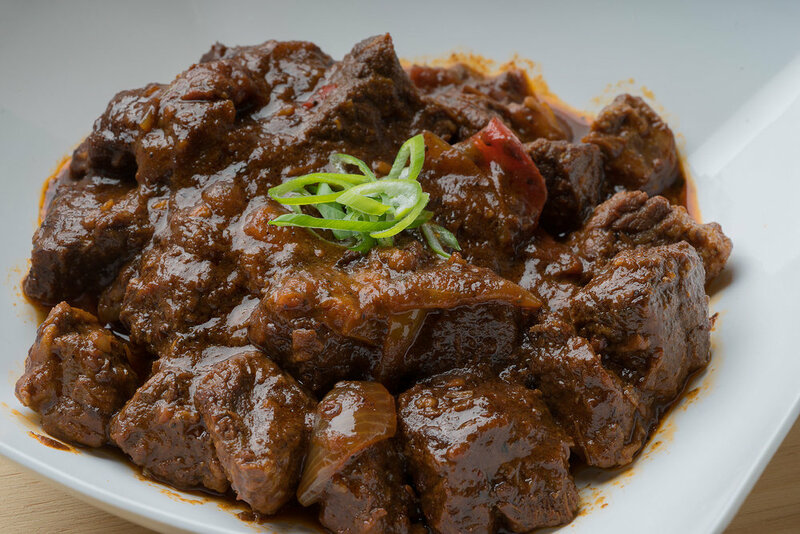 Slowly cooked beef, with the best in Caribbean herbs and spices. The perfect combination of slowly stewed pork, onions, and garlic. Ravioli served with our Jerk Cream sauce. Oven-roasted spicy eggplant, seasoned & grilled sweet peppers, zucchini, and sauteed mushrooms. Wrapped with spinach and tzatziki sauce. Dhalpuri is a thin dough with ground split peas, best served with a curry dish. Paratha is a thin flatbread, great for ripping up before dipping in curry. Bacon, romaine lettuce, tomato, cheddar cheese, and mayonnaise on a 12-grain bun. Seasoned chicken breast, cranberries, celery, green onions, and mayonnaise on rye bread. Crab, mayonnaise, romaine lettuce, tomato, salt, pepper, and a dash of lemon juice on a fresh baguette. Sliced ham, Swiss cheese and Dijon mustard on a fresh croissant. Roast beef, spinach, tomatoes, Dijon mustard and horseradish on rye bread. Roast beef, Dijon mustard, spinach, tomatoes, and horseradish in a delicious wrap. Tuna, green onions, spinach and mayonnaise on cilantro olive sourdough. Seasoned chicken breast, grilled and coated with King's Barbeque Sauce. Wrap includes Romaine lettuce, tomatoes, cucumber, and tzatziki sauce. Chicken with Ranch dressing, cheddar cheese, chopped romaine, red peppers, and Buffalo sauce. Seasoned chicken breast, chopped romaine lettuce, croutons, fresh Parmesan cheese and gourmet Caesar dressing, wrapped in a soft tortilla shell. 24-hour seasoned and marinated chicken thighs, oven-roasted and coated with our King's Jerk Sauce. Wrap includes Romaine lettuce, tomatoes, cucumber, tzatziki sauce, roasted sweet peppers, garlic sauce, and a Mango salsa. 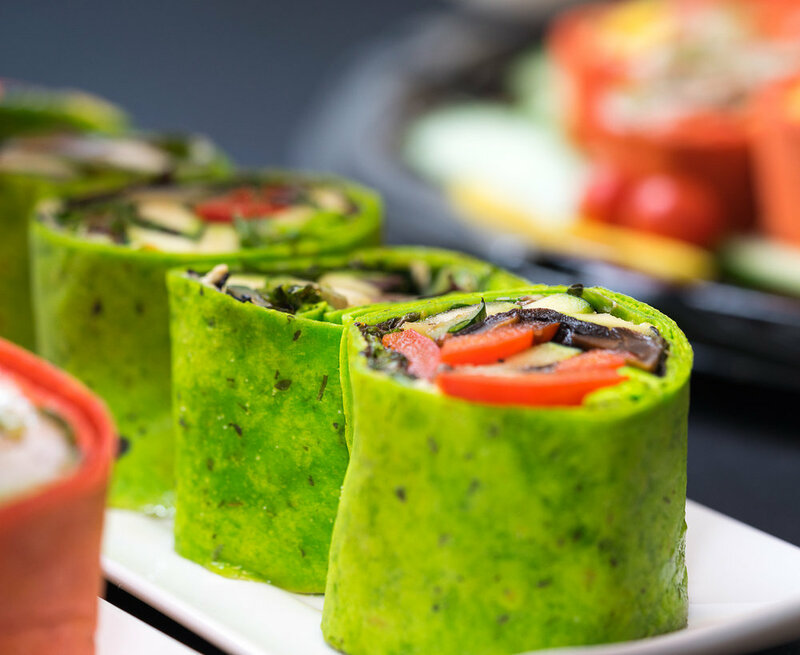 Choose from a variety of wraps: Chicken Caesar, Curry Chickpea, Buffalo Chicken, Jerk Chicken, BBQ Chicken, Grilled Vegetable, Vegan Antioxidant and sandwiches: Ham & Swiss, Chicken Salad, Tuna, BLT, Egg Salad, Crab Meat, Roast Beef, Caprese. Chicken, shrimp, and vegetable Skewers with 3 dipping sauces: garlic, spicy BBQ, and apple chutney. Combination of fruit, assorted cookies and brownies. 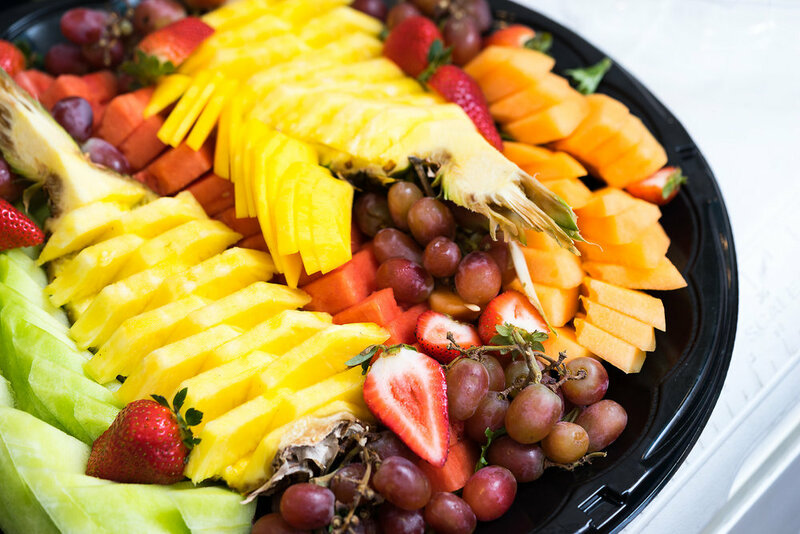 We custom-make fruit platters, catered to your needs. Celery, carrots, broccoli, sweet bell peppers with our delicious spinach, cream cheese dip. *Prices listed as per person. Packages are for groups of 50 or more. If there are less than 50 guests, please contact us and we will try our best to make accommodations. Rice & Peas and Creamy Coleslaw with (1) choice of protein. Jerk Mac & Cheese with a 1/4 chicken served with salad and corn bread. Two Tacos and one side. Soft shell tortillas with our Creamy Coleslaw, topped with (1) choice of protein. Sides include: Vegetable Spring Rolls, Bocconcini Bites, Fish Cakes, or Caesar Salad. Your choice of (1) wrap or sandwich, (1) salad and (1) soup. Entertain with (3) choices of our most popular appetizers and (2) choices of platters. Jerk Chicken Bites, King’s Southern Bites, Deep-Fried Fish Cakes, Tropical Bruschetta, and Trini-style Meatballs. *Tacos, salmon canapes, shrimp cocktails and scallops count as 2. Entertain with (3) choices of our most popular appetizers. Corporate Meals & Events, Wedding and Engagement Parties. Birthday and Holiday Parties. Bachelorette/Bachelor and Jack & Jill Parties. Breakfast, Brunches, Lunches and Dinners. And more! Call (416) 268-0776 or utilize our contact form below and someone will get in touch with you for a quote.